Another form of control valve sequencing is used to expand the operating range of flow control for some fluid beyond that which a single control valve could muster. Once again pH control provides a suitable example to illustrate an application of this form of sequencing. 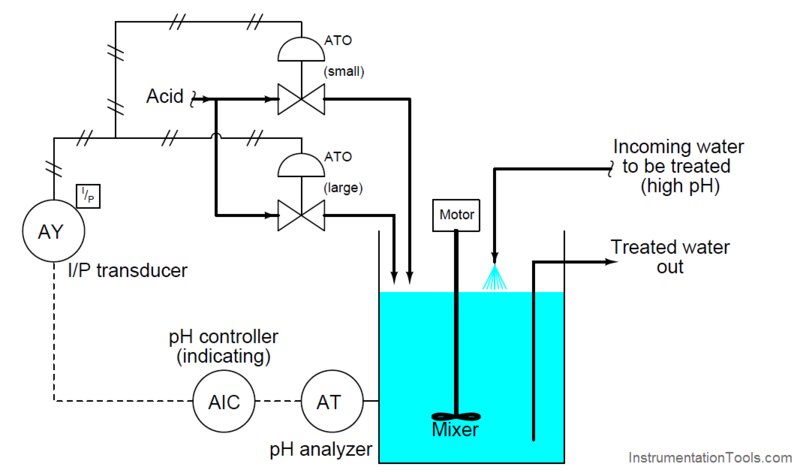 pH is an especially challenging application of process control because the dynamic range of the process is enormous. Each unit of pH value change represents a ten-fold change in hydrogen ion concentration within the process liquid. This means the difference in ion concentration between a process liquid having a value of 10 pH and a process liquid having a value of 7 pH (a pH difference of 3) is a factor of one thousand (103)! Consequently, the flow rate of reagent necessary to neutralize a process liquid stream may vary widely. It is quite possible that a control valve sized to throttle minimum flow will simply be too small to meet the demands of high flow when needed. Yet, a control valve sized large enough to meet the maximum flow rate may be too large to precisely “turn down” when just a trickle of reagent is needed. This same general control problem was encountered by automotive engineers in the days when carburetors were used to mix gasoline with air prior to combustion in an engine. A carburetor is a mechanical air flow control device using a “butterfly” valve element to throttle air flow into the engine, and a venturi element producing vacuum to aspirate fuel droplets into the air stream to create an air-fuel mixture. A carburetor with a butterfly valve and flow tube sized to idle well and respond to the needs of in-town driving would not flow enough air to provide good high-speed performance. Conversely, a large carburetor suitable for driving at racing speeds would offer poor control at low speed and idling operation. Their solution to this problem was the progressive carburetor, having two butterfly valves to throttle the flow of air into the engine. One butterfly valve passed low amounts of air flow only, while a larger butterfly valve opened up only when the accelerator pedal was nearly at its maximum position. The combination of two differently-sized butterfly valves – progressively opened – gave drivers the best of both worlds. Now, an automobile engine could perform well both at low power levels and at high power levels. On a fundamental level, the problem faced in pH control as well as by early automotive engineers is the same thing: insufficient rangeability. Some processes demand a greater range of control than any single valve can deliver, and it is within these processes that a pair of progressively-sequenced control valves is a valid solution. With the two acid control valves sequenced progressively, the control system will have significantly more rangeability necessary to regulate pH under widely varying process conditions. One small control valve (horizontal, with a green actuator) is the first to open from 4 to 12 mA. A larger control valve (vertical, with a red actuator) is the next to open from 12 mA to 20 mA. 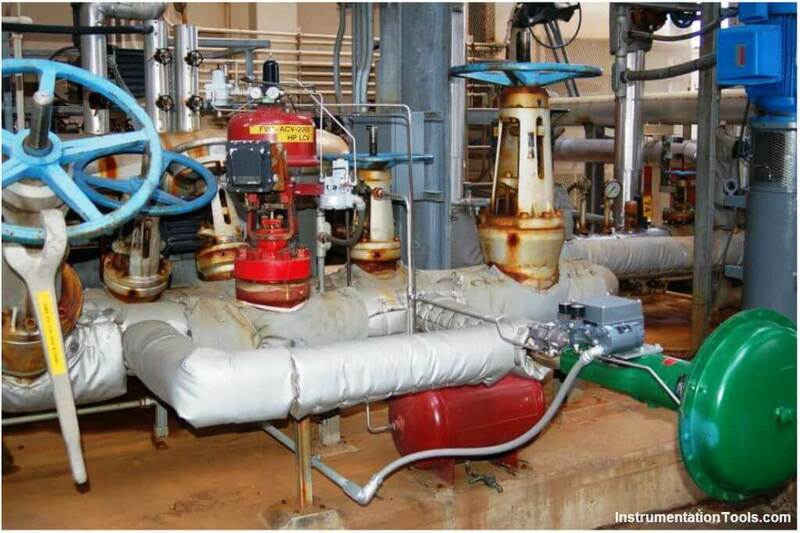 Under normal (full-power) operating conditions, the green valve is wide-open while the larger red valve throttles feedwater to the steam drum. When the boiler is operating in standby (low-power) mode, the red valve is shut while the smaller green valve throttles feedwater to the steam drum. The combination of these two control valves provides better steam drum level control over the boiler’s full range of operation than any single control valve could do alone. What is Globe Valve ?